My measure of greatness is not celebrity but how someone treats humanity, the humble, the working class, and, yes, even a simple poet like me. 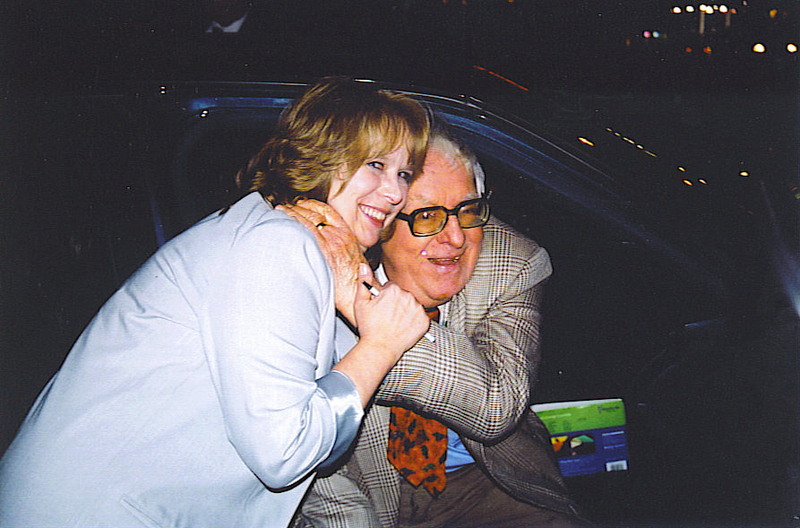 Ray Bradbury's greatness, therefore, is beyond stellar in my eyes. His creative powers, telepathic vision, and literary legacy are treasured, but what I remember the most about Ray was his friendship, his inspiration and fervent support, his love of life, his devotion to family, and all that's truly important. My friendship with Ray began in 1993 when I sent him a heartfelt fan letter, and he wrote back. That began our long correspondence, sharing books we liked, poems, cartoons, good times and bad. The first time I sent him one of my poems, he wrote "Send it somewhere---The New Yorker? The American Scholar?---to be printed!" His enthusiasm was contagious. He used exclamation marks more than me, and I loved that about him. He advised me to "Write every day from now on. A poem a day if possible, or one every two or three days. I don't want to force you. Act natural. Have fun. Be beautiful." His letters were always signed with an exclamation mark: "Love! Ray," and I've kept all of our correspondence, emails, and Christmas poems that he wrote each year and shared with his friends. I met Ray in 1997 for the first time in Eureka, Illinois. I was star struck and a nervous wreck. I did manage to buy him a pear at a local market in honor of that beautiful passage from Fahrenheit 451: "A glass of milk. An apple. A pear." I got to ride in the same car with Ray as he was escorted back to the airport in Peoria and managed a shy conversation but often found myself at a loss for words---the moment, both profound and unnerving. I composed this poem in my head as I drove 500 miles on my way home to West Virginia. Loren Logsden, the editor at Eureka Literary Magazine, published it in 1997. When I sent it to Ray, he said it was beautiful, made him cry. This time I'm crying, but not for too long. I have to write a poem today. "A glass of milk, an apple, a pear." I placed in your hand. I wanted to give you immortality. You have made me cry!!! Such a loss for us all. For you both personal, professional and spiritual. So fortunate you were to have his words in your life in such a personal way. Such an important literary figure whose words I saw ever year touch the lives of my students. As you say in your poem his words are immortal even though he is gone in body we get to keep his words!!!! I thought of you morning I heard on the radio he had died. I know he meant a lot to you, and I'm sorry for your loss and our loss. Just a few weeks before his death, I had checked out some of his books and was reading again some of the short stories I first read as a teen. My all-time favorite is "The Long Rain," but there are many more I love, such as the one about the young teacher who falls in love with one of her 13-year-old students, and the one about the dad who takes the place of his son, so the child won't have to survive the brutality of the playground. And there were so many other good stories I enjoyed reading that I didn't remember reading when I was growing up, and I could easily see his influence on Stephen King. Your tribute to Ray is lovely. Having you as a friend, Laura, is having sunlight as a constant companion. I bet Ray felt that. What a truly lovely posting-- I'm going to link to this from my newsletter. Beautiful comments. Thank you. Ray was an inspiration to me and many others around the world. I was so sorry to hear of his passing and thought of you as soon as I heard. Thank you for sharing your stories about your friendship with him.